• A $100,000 loan from a campaign committee associated with former Baltimore County Executive James T. Smith Jr.
• A $50,000 loan from University of Maryland Medical System (UMMS) board chairman Stephen A. Burch. • A $50,000 loan from pest control mogul Walter Tilley Jr. who flew her to a Las Vegas convention in his private jet weeks after she won the nomination. Tilley also contributed $6,000 (the legal maximum) to Pugh through his limited-liability company, 2303 Bel Air Road. An additional $6,000 more was forked out by his wife, Nancy Tilley, and another $1,000 from his son, Walter A. Tilley III, a member of the Harford County Liquor Board. • A $75,000 loan from Stan Udhiri, president of Reviera Enterprises. Better known as REI Drayco, Udhiri’s business has been awarded many sewer cleaning and CCTV inspection contracts by the Baltimore Board of Estimates. Udhiri, his family and his company directly contributed $12,000 to the Pugh campaign. The influx of funds also allowed Pugh to repay $25,000 of an outstanding $52,000 loan to her campaign committee from her private business, Catherine Pugh & Co. The balance due on that loan now stands at $27,000. Online filings to the Maryland Board of Elections show that Pugh, who went on to pull ahead of former Baltimore Mayor Sheila Dixon and win the Democratic nomination, collected checks from a who’s who of Baltimore-area developers, contractors, attorneys and business owners. These contributions, from events and other fundraising efforts after the April 26 primary, helped the candidate clear away debts she incurred before the primary was held. Richard O. Berndt, for instance, managing partner of Gallagher, Evelius & Jones, wrote Pugh two checks totaling $6,000. There’s also $6,000 from the firm directly and $1,000 from another attorney at the firm, Saul Gilstein. There’s also $6,000 from Ballard Spahr LLP, whose partners include Jon M. Laria, the attorney helping push the Port Covington project through city government for Under Armour CEO Kevin Plank’s Sagamore Development Company. A direct contribution from Laria of $2,500 on June 30, on top of $2,000 on April 15, brought the firm’s total to $10,500. • $6,000 from Greenberg Gibbons Commercial, builders of Foundry Row in Owings Mills. • $6,000 from Residential Title & Escrow, also of Owings Mills. The title company is headed by Howard L. Perlow, founder of the annual “Maryland Party” in Las Vegas. The loans, contributions and other financial data for Pugh’s campaign come from its latest filings, covering the period from April 11 through August 23. The data show “The Committee to Elect Catherine E. Pugh” receiving contributions totaling $1,096,951.70 and ending the period with a balance of $280,670.93. The $100,000 loan made by an entity associated with Smith, first reported by The Brew in June, came in after the April 10 deadline for filing pre-primary reports. Reportedly desperate for funds in the closing weeks of the campaign, Pugh turned to Smith, the former Maryland Department of Transportation secretary and two-term Baltimore County executive. Pugh confirmed to The Brew that she received $100,000 loan from a political committee funded by Smith called “The Baltimore County Victory Slate” and said the amount would be listed in the August filing. A close advisor to Pugh, Smith has played a prominent role in her transition team as the longtime city senator prepares for her move to City Hall in December following the November 8 general election in which she is the overwhelming favorite. 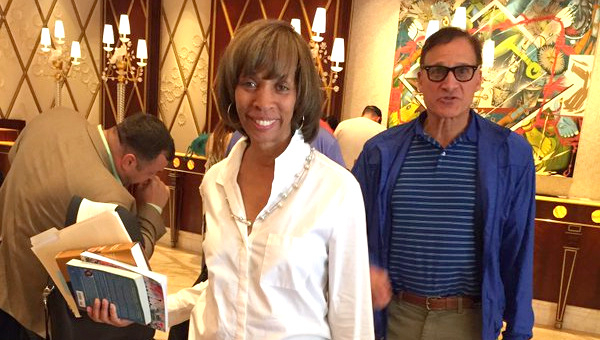 Home Paramount Pest Control CEO Tilley made news in May when he flew Pugh to Las Vegas for ReCon, the International Council of Shopping Centers annual meeting, which coincides with the Maryland Party hosted by Howard Perlow. Pugh said at the time she paid $650 for the trip on Tilley’s private jet. Also on board the flight was Home Paramount lobbyist John A. Pica Jr., a former city senator, and Thomas L. Bromwell, a former Baltimore County senator who was released in 2013 after serving five years in federal prison on racketeering and bribery charges. In addition to lending Pugh $50,000, Burch was one of many UMMS officials writing checks to Pugh at an October fundraiser organized by former Baltimore County Senator Francis X. Kelly. According to an analysis by The Brew, more than $52,000 came in from UMMS directors and top staff, including $5,000 from Burch. Pugh, in the state legislature and as a director on the UMMS board, has forged strong ties with the University of Maryland Hospital in Baltimore, which is part of the UMMS system. Among the robust contributors to Pugh are names previously known for backing her rival, Sheila Dixon. One is Pless Jones, the demolition boss who hired Dixon as marketing director for the Maryland Minority Contractors Association after she resigned as mayor following her 2009 conviction for stealing gift cards intended for the poor. After orchestrating more than $60,000 in contributions to Dixon from association members (Jones is MMCA’s president), the businessman changed course and contributed $12,000 to Pugh’s campaign through his P&J Contracting and P&J Trucking firms. A key associate, R.E. Harrington, is listed as contributing $6,000 to Pugh on the same day (June 22). Jones holds the citywide contract for emergency tear-downs of vacant houses, while Harrington does millions of dollars of sewage repairs for the Department of Public Works. Another example of altered allegiances can be found with John Paterakis Sr., the developer of Harbor East and owner of H&S Bakery, chief supplier of buns for McDonald’s on the East Coast. Paterakis gave Pugh $46,000 via eight contributions that were all dated July 22. The contributions were made in his name, that of his attorney George Philippou, and from family members. The latter included sons Charles and John Paterakis, both executives at H&S Bakery, and grandsons Alex and Eric Smith, operators of Ouzo Bay and another eatery at Harbor East. Earlier in the year, the bakery CEO boosted the fortunes of Pugh’s closest competitor. Paterakis held a fundraiser for Dixon at his Marriott Hotel suite on February 8 that netted the former mayor at least $130,000, The Brew determined. The Paterakis event was instrumental in hiking Dixon’s fundraising total above the amount raised by Pugh during the January-15-to-March-15 reporting period.